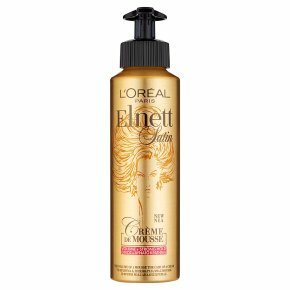 Voluptuous lasting volume and ultimate satin-soft touch.Discover our Elnett Strong Hold Volume Crème De Mousse. The hold and definition of a mousse with the care of a delicate cream. Achieve voluptuous lasting volume; the mousse builds volume directly from root to tip, giving hair sumptuous fullness. Long-lasting hold and body. The exclusive crème formula has a satin-soft touch; it delicately melts on the hair's surface to nourish curls and intensely hold the hair. Soft feel, lightweight and non-greasy.